Around 36 weeks I started showing signs of having pre-ecclampsia. This was uncomfortable and not at all what I had planned for my first pregnancy. At the time I was working at a birth center so was easily able to be monitored during my normal work day. 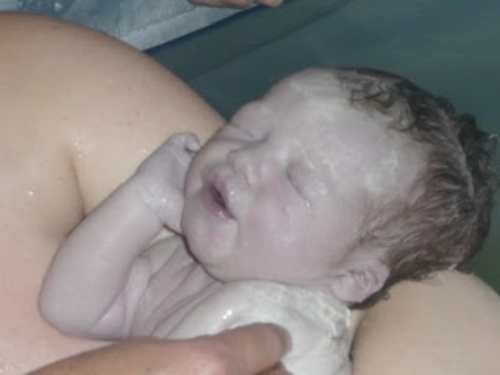 My levels were borderline so I was fortunate enough to not have to transfer out of my midwives care! The morning before I went into labor, Andy and I went to a coffee shop and I remember looking at my swollen feet thinking "I cannot do this much longer!" Every inch of me was hard to move and I still was not even "due" for another two weeks! First babies never come that early I thought, so I sent Andy off to the Blazers game and I watched Friday Night Lights believing I would be swollen and pregnant forever. At 2:45am that night though, my water broke! At first I thought I was going to the bathroom on accident but I soon learned it was much bigger then that. It took a few try's to wake Andy up (late night!) so I just kept saying his name and finally gave me a quick moan of a "huh?" I told him my water broke and he jumped up so fast jumping into labor mode and asking what he was suppose to do. I told him to just get me a towel and sent him back to bed. I put the towel underneath me on the bed and tried to go back to sleep as well. I couldn't!! Around 3:00 am I went and hung out in the bathroom, just waiting for the water to stop. I sent a text to my sister Autumn who lives 3 hours away letting her know my water had broke but that I was not having contractions yet (she went 24 hours after her water broke to start labor so I knew this could be something, or nothing at all) I then sent a text to my midwife Adele. I was still not having any signs of labor though minus the continual water leaking. I decided I would kill some time and try and put on some makeup to make myself presentable. Ha! that lasted about 2 seconds before my contractions began. Once they started, they came on with a vengeance. From the very first contraction they were every 3 minutes and quickly sped up to coming every 2. I started to put warm water in the bathtub and hopped in and began texting my birth team again. Autumn got into the car and headed south but I told Adele not to come yet. She knew better and drove on over because we were getting a bit of snow!. The next 4 hours are a complete blur. I progressed very fast and was completely dilated by 7:30 am. I remember Andy making me a smoothie, Adele showing up and looking up at her and her telling me it was snowing outside, and walking from my bathtub to the birth tub, but that is about it! I was very much an internal laborer and really did not need the help of anyone around. At 8 am I could feel my babies head about a finger tip in and I realized then that she had a ton of hair. I thought she would be here any minute! My sister had not arrived yet and I was sure she was gonna miss the main event! Little did I know though, baby had her own plans and decided to sit there for another FOUR hours! My sister showed up and so did my other midwife Joey. Everyone was there ready for action but then I fell asleep... Yes, I fell into a deep deep (think dreaming and drooling) sleep. My contractions slowed down to one every 15 minutes and I would be sleeping in between. The room was SO quiet. (except for the occasional text- pretty sure everyone was bored) Adele was knitting, and everyone else just sat there. I switched positions now and then from sitting/leaning back to hands and knees, but mostly I just slept. and dreamed. and slept! At 12:15 though, my life changed. I was so tired of waiting and finally felt the urge to push. I was ready to get this baby out! I leaned over the tub and PUSHED a couple times and there she was- by far the most beautiful thing I had ever seen! I was so amazed at my body and what it had been through! I was even more amazed that it knew exactly how to slow down and allow my baby to change position (she was assynclitic with a nuchal hand) so she could comfortably come out! I was patient, and because of that, Alomae got to come out when she wanted and on her own!